Neotropical Heliconius butterflies are members of various mimicry rings characterized by diverse colour patterns. In the present study we investigated whether a similar diversity is observed in the chemistry of volatile compounds present in male wing androconia. Recent research has shown that these androconia are used during courting of females. Three to five wild-caught male Heliconius individuals of 17 species and subspecies were analyzed by GC/MS. Most of the identified compounds originate from common fatty acids precursors, including aldehydes, alcohols, acetates or esters preferentially with a C18 and C20 chain, together with some alkanes. The compounds occurred in species-specific mixtures or signatures. For example, octadecanal is characteristic for H. melpomene, but variation in composition between the individuals was observed. Cluster analysis of compound occurrence in individual bouquets and analyses based on biosynthetic motifs such as functional group, chain length, or basic carbon-backbone modification were used to reveal structural patterns. Mimetic pairs contain different scent bouquets, but also some compounds in common, whereas sympatric species, both mimetic and non-mimetic, have more distinct compound compositions. 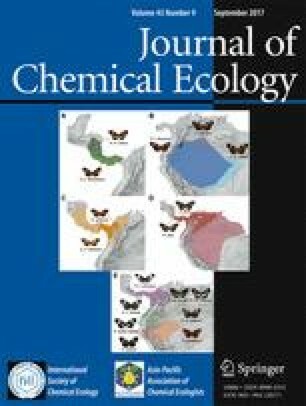 The compounds identified here may play a role in mate choice thus helping maintain species integrity in a butterfly genus characterized by pervasive interspecific gene flow. The online version of this article (doi: 10.1007/s10886-017-0867-3) contains supplementary material, which is available to authorized users. CS, CPD and ML were funded by the FIUR fund QDN-DG001. CC was funded by a Smithsonian Tropical Research Institute short term fellowship and the Torkel Weis-Fogh and Balfour-Browne Funds. CJ was funded by an ERC grant ‘SpeciationGenetics’ 339873.